A 3 Days Gorilla Trek in search of the mountain gorillas, an endangered mammalian specie. The trek in Bwindi is worthy taking given that the chances of seeing the gorillas are over 90%. This 3 days safari starts and finishes in Kampala. This safari can also be arranged for you on a private basis. It is estimated that only 700 mountain gorillas are remaining world wide. Therefore tracking some of these remaining World giants is a fantastic experience one should not miss. The tracking will take place in Bwindi Impenetrable National Park. 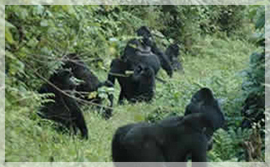 Bwindi has four habituated families and the gorillas there live in thicker moist tropical forest. Tracking is a challenging activity which may involve you trekking over the steep hillsides in search of these World’s few remaining forest giants. On the safari you will not only see gorillas. Other primates living in the forest may also be seen as well as birds. Pick up by our safari guide from your hotel and then drive for to Bwindi located in the south western part of the country. Have a stop over at the Royal drum makers and at the Equator. Connect to Mbarara for lunch and then proceed to Gorilla resort/Buhoma Camp/ Travelers Rest Hotel in Kisoro/Nkuringo Gorilla campsite/ Bwindi Travelers Motel Butogota/Bwindi View Bandas/gorilla Nest Campsite. After an early morning breakfast, go for Gorilla tracking with packed lunch. While in the jungle you may see other primates such as the L’Hoest Monkey, red tailed Monkeys as well as other mammals and plant life. Dinner and overnight Buhoma Homestead/ at Gorilla Forest Camp. After breakfast, visit the local communities and then drive back to Kampala. Have en route lunch at Mbarara. Reach Kampala late evening.